An interview with Rock and Roll Hall of Fame musician Neil Young, at the AllThingsD conference on January 31st, has been getting wide circulation on the internet for his criticism of the current quality of digital music. Audiophiles have known Mr. Young to be a vocal analog audio purist for many years, so his latest remarks probably come as no surprise if you count yourself among those who don't rely on iTunes downloads for your recorded music. According to Mr. Young, Apple's Steve Jobs was also a member of the analog audiophile community, who "when he went home, he listened to vinyl". You can watch an excerpt from the AllThingsD interview embedded below. At AllThingsD, Young complained that the compressed MP3 format represents only 5% of the original recorded master. He is not totally averse to digital, however, saying that the uncompressed high definition (HD) 24b/192KHz format can match his beloved vinyl LPs. While HD audio can be purchased for download from sites such as Chesky's HDtracks, this format is not compatible with iTunes or iPods. Young revealed that he was working with Apple on developing a new player for such a high-resolution digital format, and he believes that Steve Jobs - had he lived longer - would have developed this new technology. A more immediate answer to address the 5% problem, which doesn't require "some rich guy" to create, is to store music on your iPod in a higher resolution uncompressed format, such as WAV or Apple Lossless. That means ripping your own CDs and not buying from iTunes, along with sacrificing the number of songs you can carry. This then moves the issue of musical fidelity to the rest of the playback chain. If we eliminate the degradation of the MP3 format, there are still the issues of the digital-analog converter and amplifier - which we can't so easily change, and the earbuds - which we can. It is often said that the best place to put your money, if you are assembling a music system on a limited budget, is in the speakers. This should hold true even more so for listening through transducers that you fit directly into your ear. At the 2012 International Consumer Electronics Show, a number of companies that have long been known for high-end speaker systems, such as Velodyne, showed higher fidelity earphones (or In-Ear-Monitors - IEMs) to replace the standard iPod earbud. Other manufacturers focus more on earphone replacements as a fashion statement, or on designs that are purpose-built for use while jogging. One company, Swiss manufacturer Phonak with their Audeo line, is bringing their decades-long knowledge of modeling the ear for hearing aids to the design of higher-resolution IEMs. There are a lot of choices. To evaluate the impact that earbud replacements can make on achieving a more audiophile-like experience in iPod playback, the EE Daily News set about to perform a comparison test, starting with two products on opposite ends of the price range. On the low end are the Spectra earbuds from Logan Utah-based iFrogz Audio, which will have a retail price of $34.99, and feature a woven 1.2 meter cord to reduce tangling, a gold-plated audio jack and a lithium alloy casing. Specifications include frequency response from 20Hz to 20KHz, 16 ohm impedance, and sensitivity of 93dB. 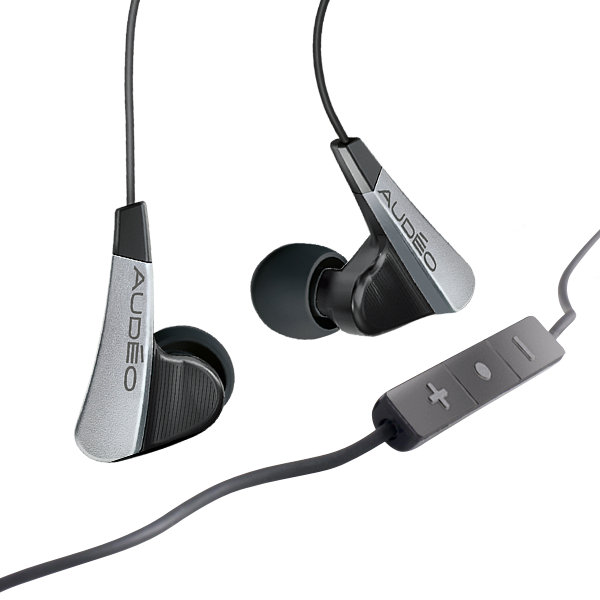 On the higher end, the $239.99 Audéo PFE 132 employs a single balanced armature design, and is specified for a frequency response of 5Hz to 17 kHz. The PFE 132s come with two pair each of two different user-replaceable acoustic filters, and a tool that you use to insert whichever provides your desired frequency response profile. Audeo designs the gray filters to enhance perception of mid-frequencies, with a sensitivity of -109dB Sound Pressure Level (SPL)/mW at 1kHz. The black filters have a sensitivity of -107dB SPL/mW at 1 kHz, and are designed to enhance perception of bass and treble. Impedance of the PFE 132s is nominally 32 ohms. The 1.2 meter cord is encased in a thicker, more rigid plastic coating (compared to iPhone earbuds) which retains its coiled shape and avoids tangling. Audeo supplies three pairs of silicone ear tips, one each in small, medium and large sizes. An additional pair of medium-sized "Comply™" foam tips are to designed to provide greater filtering of ambient noise. Other accessories included with the PFE 232a are an ear tip cleaning tool, optional "Perfect Fit" silicone ear guides to ease routing of the wires around and behind the ears, and a soft carrying case. Since the objective of these IEM evaluations is to see how close we can get to an audiophile experience, a set of high quality audiophile reference recordings are required. We have used Chesky Records' "The Ultimate Demonstration Disc" to test audio equipment for many years, and know the material to be some of the most realistic recordings available on CD. The evaluations will be conducted in a set of consecutive A/B/C listening tests in a single setting, so familiarity with the reference will aid in the comparisons. 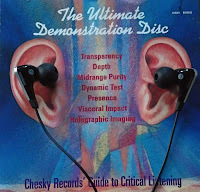 Chesky selected the recordings on The Ultimate Demonstration Disc to teach listeners how to discern, and be able to evaluate, various qualities of an audiophile system. Some of these qualities should be very challenging for an IEM to achieve, since our whole ear, head and even our body affect our response to loudspeakers and live music. On the other hand, the direct interface to the ear canal is an aid to pick up details we might miss otherwise.